Designing more TenCentimetre Triremes. In the process of organising exactly how they should look. I had to be clear about decks and covers. The pentekonter was sometimes fitted with a deck. This was really a gangway connecting the focsle and the poop. With this in place sailors could move easily about the ship. The rowers were not covered by this deck in any way. According to Thucydides it was Cimon of Athens (510-450bc) who first introduced completely decked ships into the Hellenic experience. Not Cimon's best day. Ostracised for 10 years after his first period of influence. These ships were triremes, much larger than the pentekonter. 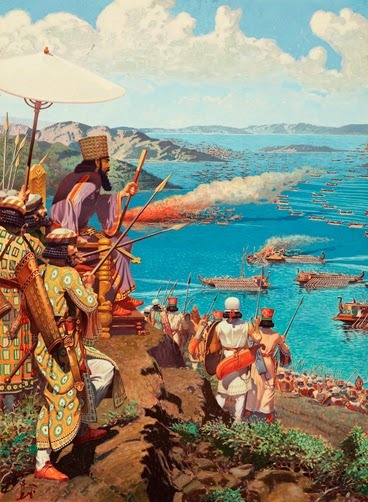 Some Persian ships present at Salamis (480bc) are referred to as 'lofty decked' or 'high decked' and the Persian ships at Salamis could accept 30 warriors aboard over their normal complement which points to them having plenty of deck space. 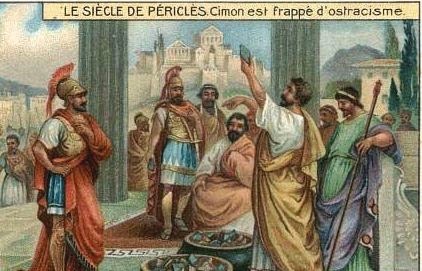 The 200 ships Cimon decked-over were trained by Themistocles particularly for speed and manouvreability and with them he won the double victory at the mouth of the River Eurymedon in 466bc. (Plutarch). Maybe these were not the first completely-decked ships used by Greeks but the text suggests they were a novelty. The narrow bridge connecting focsle and poop was extended to create a continuous deck from gunwale to gunwale. The ships gained a broader profile. Now the extra marines could be accommodated on deck without crowding and they could get to all points of the ship's perimeter to hold boarders off or attempt to board enemy ships. The Athenian preference was for ramming tactics, not boarding tactics, and the extra troops would never become a permanent fixture. 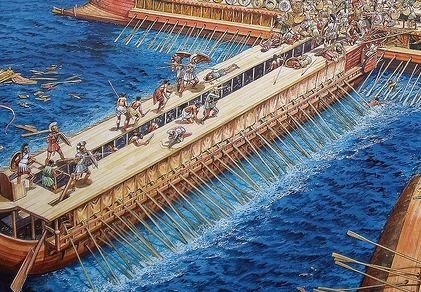 We later hear of transport triremes as distinct from fighting triremes. Ships built for naval supremacy in this era were built for speed and agility. Not a good idea to have a clump of hoplites standing in the bows. This would affect the ship's handling and each stroke of the oars would dig the bow into the water. The extended deck, however, also gave a new opportunity for the seaworthiness and combat capability of the trireme. The thranites were now protected from the sun's glare by a cover. The summer sun of Mediterranean latitudes is enough to debilitate men working hard at the oar in its full glare. 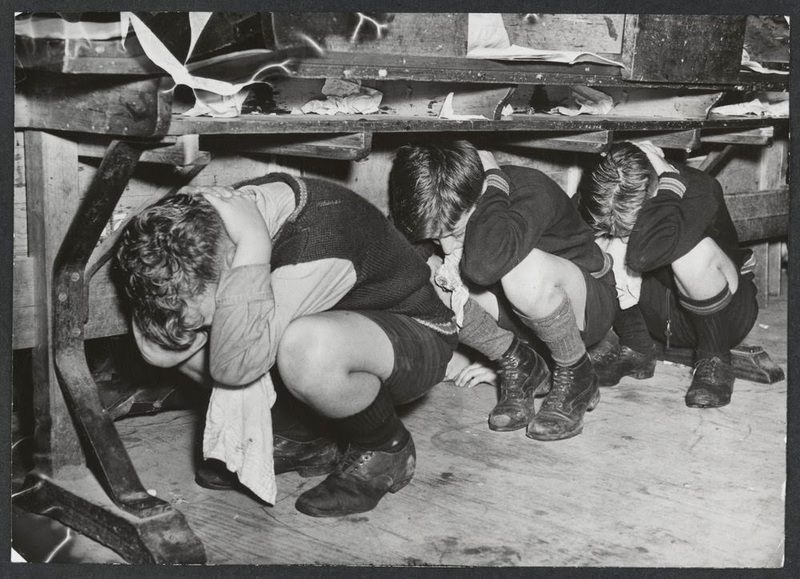 Air could still sweep through the ship to aid cooling as the men sweated. The deck's purpose was to allow troops to fight against other ships and defend their own. It was substantial enough not to collapse under ramming impacts or when men massed in one place. It was normally furnished with a knee-high rail to allow the troops to save themselves from slipping overboard or to rest shields against. At Salamis these shield-lined bulwarks were instrumental in disordering the Persian lines as the wind caught them and the ships drifted out of formation. Greek trireme (somewhere between cataphract and aphract? )approaching a Persian vessel with a full deck and balustrade with shields afixed. The edge of the deck continuous deck could also now be used as a fixing point for protective leather screens to keep missiles off the rowers in combat. This innovation created a definite class of ships toughened for combat, the kataphract. Kataphract simply means 'enclosed all around'. The motive power of the ships was now protected by a deck which covered them above and leather screens fitted in place when battle was due protected them all around. Erroneous idea about missile screens: the shields should replace the screens or be fixed onto the main deck's guard rail. The basic or 'pirate style' ship which was open in structure with the narrow deck and lack of screens can be termed 'aphract' or 'without enclosure / open'. Just what this screen was like we can learn from later sources which describe ship equipment. 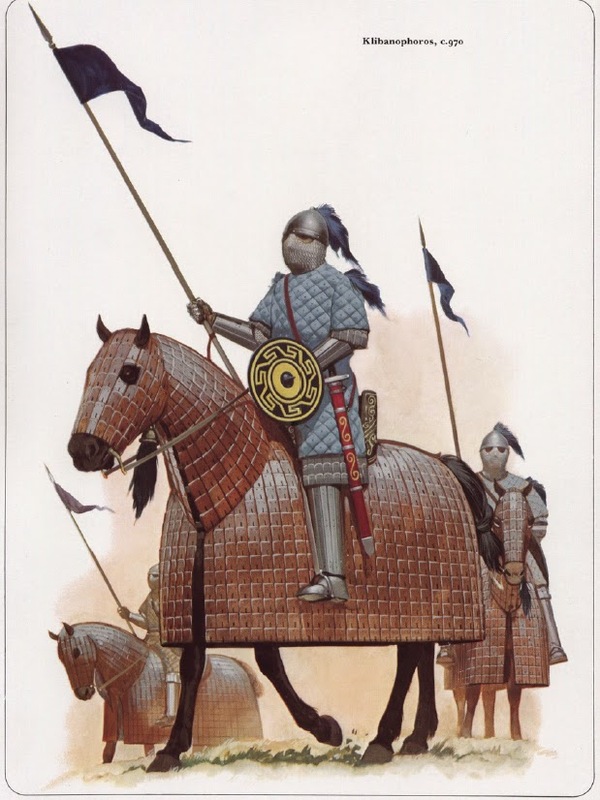 Accurate illustration of a cataphract. The missile screens run from the deck edge down to the outrigger. It is not impossible that the parrarhymata were made of sub-elements fitted together, such as individual skins, but they are listed as two definite items. They were probably made of tanned hides but tanned hides were different to what we think of today. Ancient tanning processes did not penetrate the whole skin but left a layer of near-rawhide sandwiched between two softer outer layers. 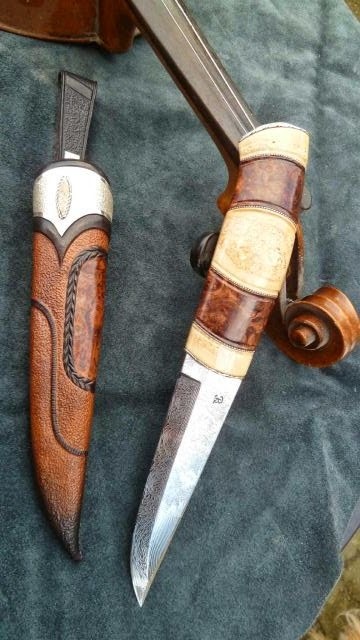 The finished product could be more manageable than rawhide but still be very tough and capable of repelling missiles or trapping them rather than letting them pass right through. The screen was rolled-out along the deck and fixed to the gunwale somehow – probably with loops and ropes. It could then be hung down and attached by its lower edge to the top of the outrigger upon which the thranites rested their oars. The oars were not obstructed and the rowers could still see the water surface downward past their oars. With the parrarhymata in place, the oarsmen were now protected from javelins, stones and arrows in combat. Even if a missile could penetrate, it could not be aimed at an individual. Parrarhymata were not the only solution. Shields could be hung from the gunwale to fill the space in the same way. The cover provided by this was not so complete but was more robust. The Erment model clearly shows that this was used on Phoenician ships. The shields on the Erment model hang down to protect the thranites. WHY WERE MISSILE SCREENS NOT USED UNIVERSALLY? At first thought it seems odd that missile screens were not fitted to all ships for combat. We know. however, that missile screens were not used by all ships at any one time or by Roman warships A.D. .
One reason why this seems odd is that we assume that the rowers were very vulnerable and that disabling a few of them would disable the ship. This may not have been so for several reasons. A ship had sailors on board who were not rowing. They could help wounded rowers and maybe take their oars inboard or post them out to discard them before they caused to much chaos. 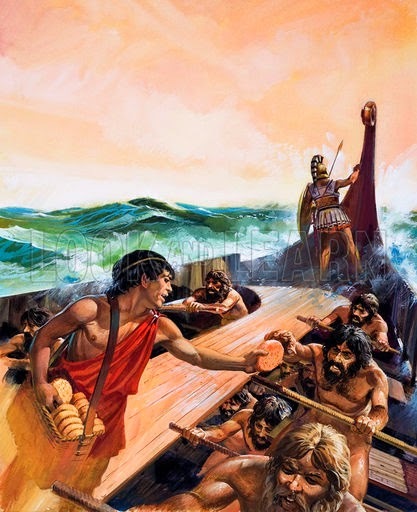 The thranites, the upper tier of oarsmen were most vulnerable and these were the most easily helped if stricken. The deck crew and sailors could use shields to deflect incoming missiles from the thranites. Unless in the act of ramming, triremes would hold a respectable distance from each other, about 150 metres. It is not easy to shoot accurately over this distance at sea. For this reason shooting with bows would be reserved for closer ranges. When ramming, a ship would approach bow-on to the target and often from the rear so that the oppurtunity for effective shooting was reduced. 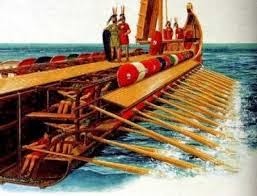 A trireme has 170 oarsmen. Shooting 5 of them will not disable the ship. Shooting 20 will disrupt the ships operation. However, a 'standard' Greek trireme had just 4 archers onboard, detailed to protect the captain and helmsman. It seems the concept of shooting an enemy ship out of action did not really exist. Finally we must remember that 'fast' ships did not have decks. The weight of a deck and the weight of the men who used it decreased a ship's agility significantly. So long as ramming was the raison d'etre of the trireme the deck was not universal and therefore neither were missile screens. The last word we will never know, but it seems that the practicalities of fighting at sea ruled out any serious advantage to be gained by trying to shoot the enemy ship's motor to pieces. The parrarhymata had another useful function on triremes. The problems of wave tops and spray coming into the ship in choppy conditions was countered by running the parrarhymata from the hull up to the outrigger and even on to the gunwale. In this way a screen for reducing the amount of water coming inboard and also to reduce panic amongst drenched oarsmen which would otherwise interrupt a good rowing rhythm. Not quite accurate but closest I could find.. A trireme under way with some kind of spray-screens in place. Despite the deck, the sun could be a problem if the ship's course continuously exposed the thranites of one side. A single sun-screen was among the ship's equipment. It was stored with the sails so was probably also of linen canvas. This would be lighter and less claustrophobic than the leather missile-screens. Perhaps the sun-screen could also be erected to shade the deck area but to avoid the sun deck crew could just go below for a while. This is what you get for websearching for sun-screen and deck. Aphract ships would have use for a sunscreen also. It could be rigged on ropes to lie over the rowers at an angle against the sun. One must not think that rowers normally sweated and baked in the sun over their oars, though, the ship would use its sail as soon as it was out of port and the wind was suitable. 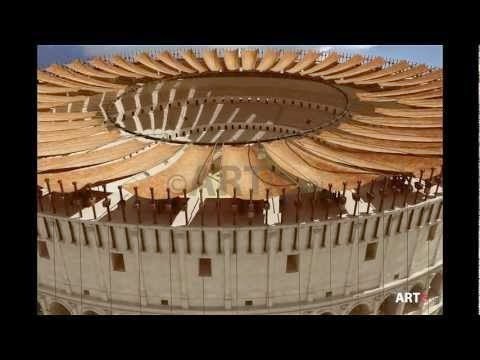 Roman amphitheatres had sun awnings operated by sailors. Fast ships were not decked-over and did not have missile screens. Kataphract triremes had continuous decking and missile screens. Screens were not permanently fitted but put in place for combat. An aphract ship had neither a continuous deck nor missile screens. To be used as a fighting platform, and to carry more than a handful of combat troops, ships needed a continuous deck. 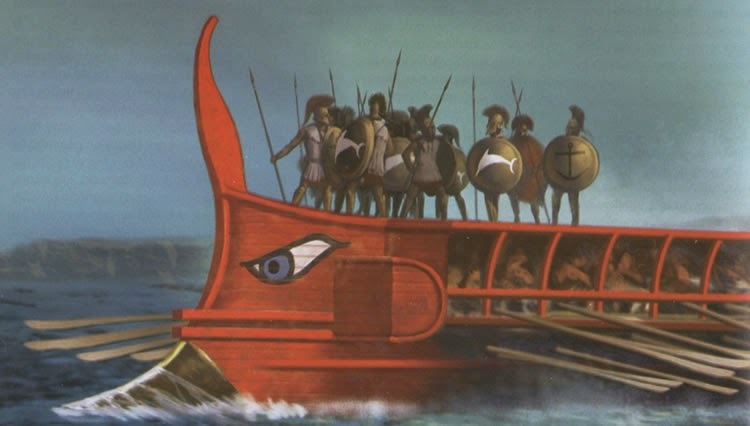 The replica Olympias, contrary to many commentaries, does not have a continuous deck suitable for supporting combat troops. The top decking on Olympias is there to act as a sun canopy. It is too light to take more than a few people – certainly not a mass of armed men. In addition it has no side-rails. The poop and foc'sle are separate deck areas. Despite mentioning that it was used to stop misiles and protect against the sun, there is no ancient evidence for this arragement. Either there was a continuous deck or there was a central way. If a central way then the ship could not be enclosed. 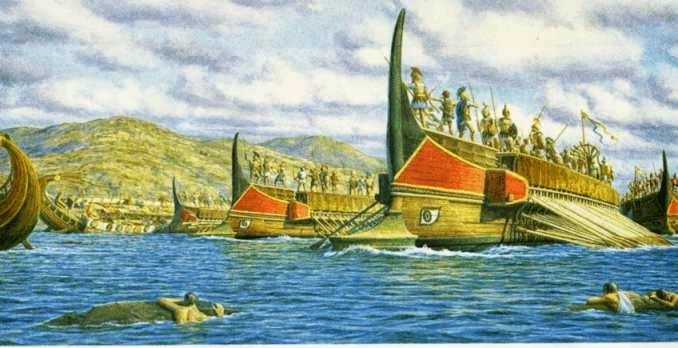 The Athenian triremes present at Salamis were aphract. Their combat troops were for defence rather than siezing enemy ships. 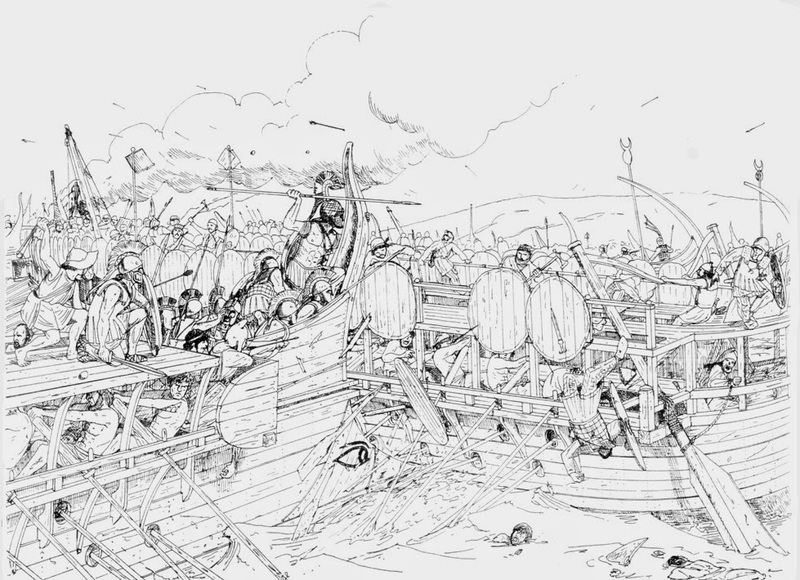 The Persian ships were mostly fully decked and had 30 to forty troops aboard for shooting and boarding. They had rails around their decks, a defended foc'sle and crews which had been rowing all night.